Eventually you'll lead to a vague 'out of range' crash if you create new skeletal characters based on another mesh (like say a pre-rigged base mesh or two more dark elves based on one particular dark elf). - You'll want to activate the Unreal PSK exporter addon (which comes standard with Blender 2.6), however we won't be using this to export PSKs. More on this later. - Duplicate your mesh. Clear the parent and keep the transformation on the duplicate. 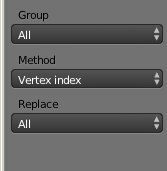 - On this duplicate, enter Edit mode, and on the Tools at the left, scroll down to see Unreal Exporting options and click "Remove Vertex Groups"
- Parent that to the same armature but with Empty groups this time. - Enter Weight Paint mode. Transfer weights, with All and Vertex selected. This will take your old weights over from your broken mesh over to your duplicate, but in a more 'sane' way. - Now export your duplicate to IQM! BUT BLENDER HAS A "REMOVE ALL VERTEX GROUPS" BUTTON ALREADY!!! WHY USE UNREAL PSK EXPORTER'S!? Blender's function doesn't remove vertex groups that are malformed and out of range. The PSK exporter can do this which helps greatly with this repair. WHY USE WEIGHT PAINT TO DO THE COPYING WHEN YOU CAN USE BLENDER'S COPY FUNCTION? Because "Copying Vertex Groups to Active object" also copies the malformed ones! Transfer weights is much safer. Potentially very helpful, thanks for posting this. Can you explain in a simple sentence what the actual problem is, though? Something about bad vertex groups? Where do they come from? It could potentially happen if you've refactored your armature to have less bones since weighting. In my case, it was removing a bunch of finger bones. I see. Removing bones will leave bad vertex groups. Thanks for the Unreal exporter trick.